2-Way 4th-Order Vented-Box System - 5" Bass/Mid, 1" High-Frequency - Recommended amplifier power: 25W - 100W continuous into 8 ohms on unclipped programme. Available in 5 colors: Burgundy, white, grey, turquoise, and black. I love these speakers. If you can scoop up a used set for an okay price, you should go for it. I purchased a pair of LM1's ex demo to use in a second room for stereo only (Using Klipsch and Rotel for HT in the main room). I combined with an 8" powered subwoofer, and although only running off a Marantz combined receiver / Cd Player / Amplifier the sound quality is amazing. Everything on my I-Pod now sounds brilliant whereby on other systems there are a number of tracks with deficiencies. Low or High volume they are clear and clean and somehow never manage to sound harsh despite the volume or music selected. My only gripe is the complexity with wall mounting - despite other reviews the holes are wider than wall studs, and it would be significanltly easier to mount the brackets first without the speakers attached. However despite this minimal issue now that they are up and running I am hooked - I even prefer to listen to them at the moment over the Klipsch / Rotel setup! LM1: This speaker is much more efficient and has a forward sounding mid-range versus the M1's. It has, in my opinion, a much better mid-range than the M1 that almost sounds like a mini FST with its delivery. Versus the M1 the vocals and certain jaszz instruments sing, and are not drowned out or muted as they are in the M1, frankly. If I were looking for a set of mini "fronts" in a HT set up or a center channel (for sure) this is a better speaker than the M1, in my opinion. As a set of rear speakers they are not particularly good, as they can overpower the fronts if allowed and don't image particularly well. M1: The tweeter is more refined versus the LM1 for sure and they image much better. These are excellent rear speakers in a home theatre set up as they just blend in to the background and they image quite well. They are less efficient and will not over-power the fronts. Bass is actually tighter than the LM1's as well, though of course there isn't much bass at all. They truly lack a mid range, however, comparatively speaking, and they are not well suited for certain kinds of music. They make great rear speakers. of bass, I mean "hello...", it doesn't take a genius to figure out that SOME speakers aren't meant for bass. Put them all in a kiddie-pool somewhere far away. 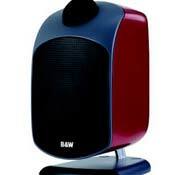 Simply stated, these speakers are excellent. They have been, are, and will continue to impress me, just like the first time I took them out of the box. The tweeter grills come off, but I think it's a good thing. I don't know what all the other reviewers' issues are, they only time they come off is if the speaker is upside down, or you physically take it off. Like a good dog, can't beat it, go B&W all the way! Good design, well shaped. Multifunctional base, for mounting on wall, seling, every were. I used the speakers in my room, and they sounded good. Placing them was almost easy but there I was wrong. It took about three weeks and then I got the best position. Now I've got a subwoofer, Heco ONYX 1000 to fill the lack of bass... Ideal combination. Imaging,value,cute shape,good as rear speakers. These cute little speakers are ideal for use as rears in a HT setup.They are good looking (available in 5 colours),good value,specially as I won mine by registering the gaurantee online,for my b&w cdm7nt main speakers! and also very flexible mounting-wise with the moveable base. LM1's also sound good for their price,I tried them instead of my cdm7nt's,and they put on a decent effort,good imaging,good bass and treble for size,obviously when cdm7nt's were back in place,it was like a veil had been lifted. I tried them in the kitchen for a while,but their cute design was lost,as they were on top of cupboards,so eventually they came back in the living room where they took up residence on stands, as the rears in my HT,where they are very impressive. Open and airy, good tonal balance, good off axcess performance will work well for surrounds. My 4 star rating reflects price. But these were truly better than I imagined. I bought 3 for surrounds and center surround. A bit pricy, but quality mount and flexibility will make you smile when tweeking placement. Let's get this straight. These are VERY small units with 40% less volume than a Paradigm Titan. They are designed for best performance on a wall and REQUIRE a sub if you plan to use them in Home Theatre applications of ANY kind. No speaker this size can produce musical bass without a sub-period! In my test I placed the LM1's on Target Stands with MIT speaker cable. They were driven by an Outlaw 1050 and Rotel 1075 amp. Speakers were rolled off using the Outlaw's Xover at 80hz. Subwoofer is the Paradigm PW2200 which I set at near 85hz. Using Lyle Lovett's Pontiac in Stereo mode produced excellent tonal balance, even at high volumes. There was a slight grain when compared to my Carver Ribbon speakers, but nothing objectionable. Imaging was good to excellent, but required some toe in. Still, imaging was far short of what the big rbbons can do. The LM1's showed very little of the boxy sound that plagues units of this type. For HT use they excelled again, blending well with the B&W CDM center. All in all this is an excellent speaker that will work best in surround sound applications. Versatile, wall mounted. Decent low end. Awesome soundstage. Breakin, even during a listening session. I have these speakers wall mounted for a long time as my second zone. Driven by a 60 Adcom amp. Compared with mirage speakers and various in walls. These are awesome little speakers. They do take some time to break in, and I find that they sound better over a listening session (loosen up or something). I had to move so I stuck them in my main listening room, and plopped them on top of a pair of JMlab cobalt 815's. All I can say, is these speakers look good, are versitale and have real low end extension. The high freq's esp with the tweeter bubble removed are very very nice. Good soundstage to boot. I honestly dont know which speakers I like better. Tradeoffs with both, but that B&W imaging, and mid/highs are killer. These are truly great little speakers. I'm using them as surround speakers matched with the B&W 602 S2 in the front and they do a great job. They have surprisingly good dynamic range and have a unique style that makes them a great buy. The only minus with them is the front grill, it pops off sometimes and can be a bit difficult to put back on. Bought these b/c they sounded decent in the store and they had the cool "look" and size I needed for a modern setting. Used in my secondary system, they sounded OK - nice highs, but were missing "depth" and 3-dimensionality in the mids (sound kind of flat and congested). Of course, bass is missing b/c of the small enclosure. My old bookshelf Lineaums I got for $99/pair from Audio Advisor blew them away - fuller sound, smooth midrange, better highs, more bass - but, they're too big & look ugly in my room. So, I thought I'd check out the Blue Room Minipods (www.minipod.com), which are made by ex-B&W guys (B&W used to distribute the original models). Only $50 more than the LM-1s & shipping is included anywhere in the US. You save on marketing/distribution costs since they're sold direct only for now - made in Holland (not Taiwan, like the B&Ws), impeccable finish. They look even cooler than the LM-1s (they were even in the "Lost in Space" movie), and they trounce the B&Ws in sonics! As soon as I hooked them in & did a comparison - better coherency, more bass, and they sound open and clear (unlike the LM-1s, which have a "closed-in", dead characteristic that makes them sound like the small speakers they are). The LM-1s never had any realism in my system, even when I hooked them up to $15k worth of other gear as a test. Minipod = the best compromise between sound quality & ultra-mod looks in a small speaker. If you're thinking of the LM-1, I'd strongly recommend the Minipod if you're OK w/ the radical looks, since they are superior, in my opinion. My guess is that Stereophile & Audio's great reviews were influenced by B&W's big ad budget. Maybe great for computer speakers, but for real music, I'd look elsewhere. 2 stars for value b/c they're expensive for the sonics you get, 2.5 stars overall b/c they do look neato!